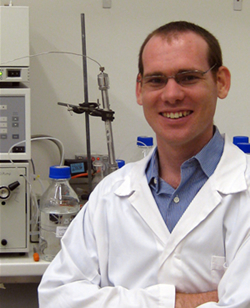 Ben Ross graduated with a First-Class Honours Degree in Chemistry (1999) and then moved to the UQ School of Pharmacy where he gained a Doctorate in the field of Medicinal Chemistry (2004). He worked in the School of Molecular and Microbial Sciences as a Postdoctoral Research Fellow with Dr Ross McGeary for two years (2004-2006) during which he completed the synthesis of a variety of biologically useful molecules. In June 2006 Ben was appointed to a Lectureship within the School of Pharmacy. Ben’s research spans the disciplines of medicinal chemistry, drug delivery and organic chemistry, with a focus on the development of drugs to treat disorders of the central nervous system (CNS). Over the last 5 years Ben has published extensively in journals having a moderate to high impact factor in his specialised area of research. 2 April 2013: Welcome Mr Suresh Veliyath (PhD candidate). Suresh has a masters degree in pharmaceutical chemistry from Rajiv Gandhi University, Bangalore. He worked as a project assistant at the Indian Institute of Science (IISC) Bangalore and as a faculty member at MIPS Hyderabad, before joining the Ross Group. Suresh's PhD project is focused on AD drug discovery. 6 February 2013: Welcome Mr Girdhar Singh Deora (PhD candidate). Giri completed a MPharm from Rajiv Gandhi Technological University, Bhopal in 2009. Prior to joining the Ross Group, Giri worked as a research associate at Rajiv Gandhi Technological University (2010-11) and at Dr Reddy's Institute of Life Sciences, Hyderabad (2011-13). Giri's PhD project is in the field of AD drug discovery. 10 January 2013: Welcome Mr Edward Lee (PhD candidate). Eddy completed a BPharm (2010) and postgraduate honours (2012) degrees at UQ and he was awarded an APA scholarship for his PhD project to develop anti-viral nanoparticles. 1 November 2012: Welcome Mr Satish Dighe (PhD candidate). Satish was awarded an MPharm in 2009 from Pune University, and worked as a research chemist at Zydus-Cadila Healthcare Limited (2009-11; Ahmedabad) and as a research assistant at the Birla Institute of Techology and Science (2011-12; Pilani), before joining the Ross Group. The topic of Satish's PhD project is AD drug discovery. 3 July 2012: Welcome Mr Srinivas Kantham (PhD candidate) who is funded by a prestigious Prime Minister's Australia Asia Incoming Postgraduate Award. For his PhD Srinivas is developing polyphenols as disease-modifying drugs for AD. Previously he worked as a research assistant at the Indian Institute of Chemical Technology (IICT) Hyderabad. This web site was last updated on 16 December 2015. Copyright © 2006-2016 Benjamin P. Ross. Unless stated otherwise, this web site represents only the views of Benjamin P. Ross and not the views of The University of Queensland. Simple site map.